This is one of my favorite polishes of all time. 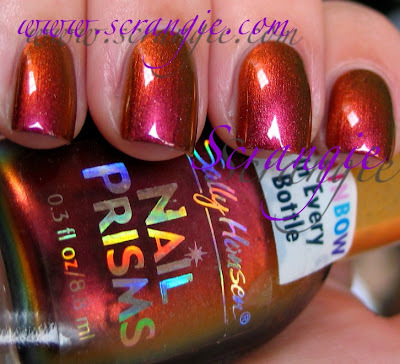 It's one of the best shades to come out of the Nail Prisms line, and in my opinion, one of the best duochrome polishes ever made. It seems like there are quite a few purple/silver/green type duochromes (like Zoya Ki) and a lot of blue/purple duochromes (Like Sally Hansen HD Laser), but not very many of these red/orange/gold/green type multichrome colors. 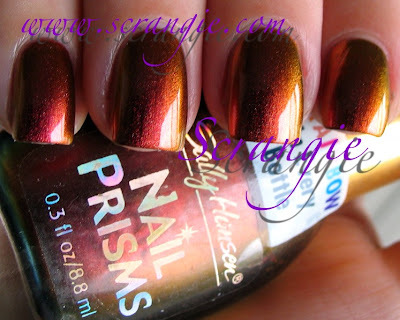 Sally Hansen Nail Prisms #08 Amber Ruby. Is this not the most gorgeous thing you've ever seen? It's so richly colored, it's like fall in a bottle. It's even perfect for Christmas- doesn't it look like a warm crackling fireplace, green garland and golden ornaments? The color shift in this is very strong and very dramatic. It can go from red and amber to all green and gold in a split second. 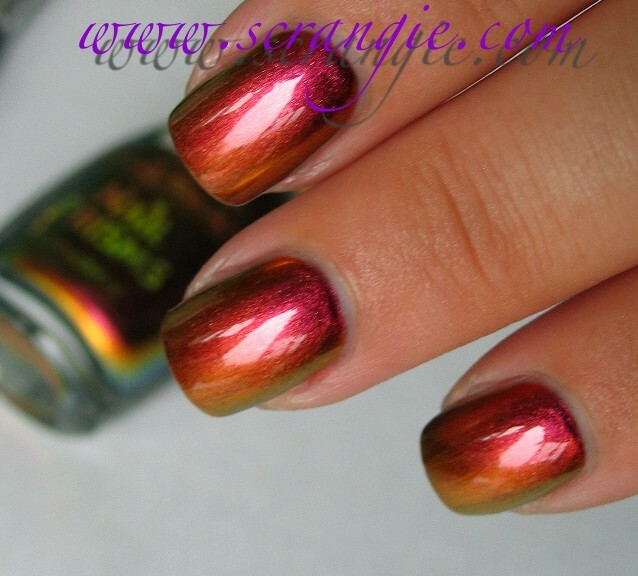 Beautiful polish, it's absolutely stunning! so gorgeous! I had a bunch of Prisms, including this one, years ago and foolishly gave them away. I've got Burgundy Orchid and Ruby Emerald again however and I'm never giving them up! Aw man I want this so bad! I LOVE this!!!!! When did you buy it and how much was it? *SWOON* Absolutely fantastic! You captured the colour shift so well. I found this at Dollar Tree back in October and I about peed myself! This is such a gorgeous color - absolutely one of my top 10s. 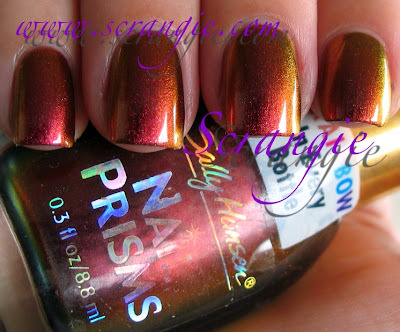 i LOVE this.. i would kill to find some of these nail prisms!! SO gorgeous! You description got me extremely excited for Christmas!!! Great swatch and capture of the color! That is one of the most gorgeous colors I've seen. beautiful! i just bought Golden Tourmaline and Ruby Diamond from Ebay for a reasonable price. i wonder if they still have any of these lying around at Dollar Tree. Thank you so much for swatching multi/duo-chromes, especially Nail Prisms. It makes my heart happy! I have a request, can you provide picture spam for "Turquoise Opal". It is my favorite polish of all time and I can never look at it enough! 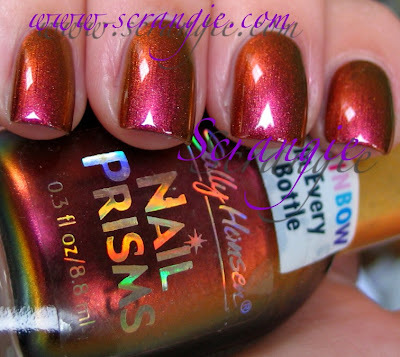 I have at least 30 Sally Hansen Nail Prisms, and Amber Ruby is definitely one of my favorites. It looks absolutely beautiful. 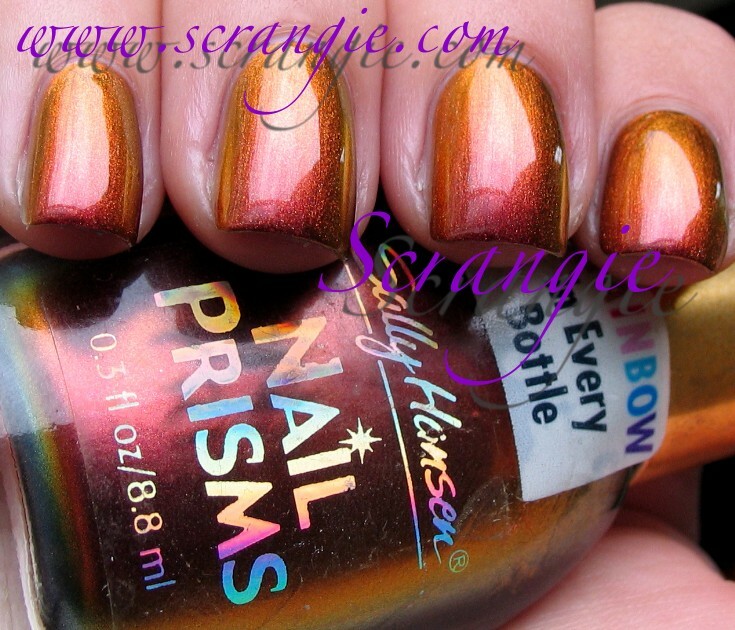 I have this polish and love the idea, but mine is really sheer and takes forever to dry! 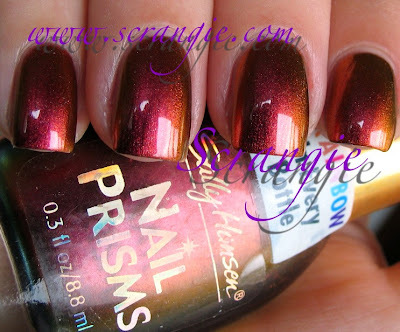 Yeah, I'm gonna need to locate this polish ASAP. It is absolutely gorgeous! This is so beautiful! My Dollar Store used to get odds & ends of these polishes in. Not anymore. So disappointing.